There are two types of safety autoglass that is used for automobile glass and windshield replacements. The first is a laminated glass that is most commonly used in windshield replacements. The second is a tempered glass which is used in side window and back glass replacements. 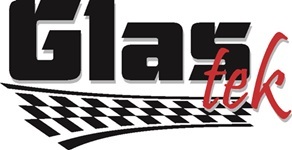 Please note: Glas Tek is an Phoenix autoglass and windshield repair and replacement company and does not manufacture glass. We buy autoglass from manufacturers and distribution companies including: Pilkington, Mygrant, and Service Auto Glass. A laminated autoglass is compromised of two layers of glass with a plastic vinyl sheet in-between called poly vinyl butyral (PVB). Laminated autoglass is the only type of glass that can be used for windshields. This plastic interlayer is the windshields strength. When an object strikes a windshield it will typically break the outside layer of the glass keeping the vinyl layer and inner layer of glass intact keeping passengers safe from any road debris. In addition, it keeps passengers safe “inside a vehicle” in case of an accident or rollover. 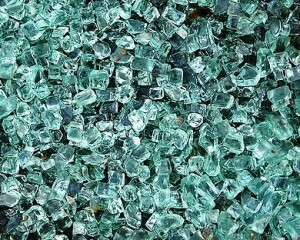 Tempered autoglass is five to ten times stronger than standard autoglass and breaks into small oval pieces upon impact. Unlike, laminated glass, tempered glass cannot be repaired and must be replaced when broken. Tempered glass cannot be cut-to-size after the tempering process in completed. Plate glass can be cut to size than tempered for code and strength requirements. Tempered glass is manufactured through a process of extreme heating and rapid cooling, making the glass much stronger and harder than standard glass. An automobiles door glass, quarter glass, vent glass, and back glasses are typically made with tempered glass making it easier for passengers to get out in case of an accident or fire. Tempered glass is also stronger and more resistant to extreme temperature changes. 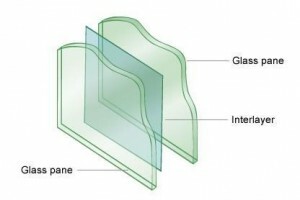 Most laminated glass such as windshields are now available with a shade band across the top of the glass. This darkened color has been added to the Poly Vinyl Butyral (PVB) layer between the glass and not to the glass itself. The darkened color helps improve the driver’s visibility by reducing the suns glare. Shade bands typically come in these following colors; however, are not available for each vehicle type. Most domestic windshields come with a blue shade option and many foreign vehicles depending on the vehicles interior color may offer the shade in a bronze, gray, or green color. The windshield shade band width and darkness is regulated by Federal Motor Vehicle Safety Standards (FMVSS) and cannot be modified. Please note: Tempered glass does not come as shaded because the shaded area is added to the vinyl inner layer of laminated glass which tempered glass does not possess. Front door glasses are only allowed to be produced with a light color to them in accordance with regulations. Therefore, if your front door glass is darker than your front windshield then it is not a factory tint. Your door glass has had an aftermarket tint applied to the glass. Most people do not realize this because the automotive dealer they purchased the vehicle from has applied the tint prior to purchasing. The glass in the rear of a vehicle such as the rear door glass, quarter glass, vent glass or back glass can commonly have a dark gray privacy color to them. Some will possess a mirror look and some will not. Windshields, even when tinted, must transmit sufficient light not to impair the driver’s vision for night driving. 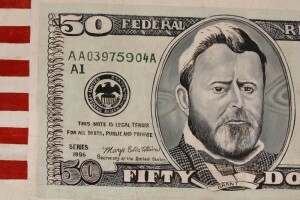 All auto glass parts, whether from the original equipment manufacturer (OEM) or an aftermarket replacement, are required by the Federal Motor Vehicle Safety Standard to place an identification code in the form of a monogram (more commonly known as a bug) on the manufactured windshield or auto glass part. “AS” designations signify the amount of light (minimum of 70 percent) that can enter a lite of auto glass. “AS” refers to the American National Standard –Safety Code and is a series of tests, including the transmission of light. The following is the common designations for there applicable parts.